Stonework where the stones are laid dry with no mortar joint. The term chiefly refers to walls in rural areas that perform the function of a wall using natural rocks from the adjacent land, thus helping to also clear the land for other use. Vertical stones fixed at the top of walls in sheep grazing areas to stop sheep jumping the wall. 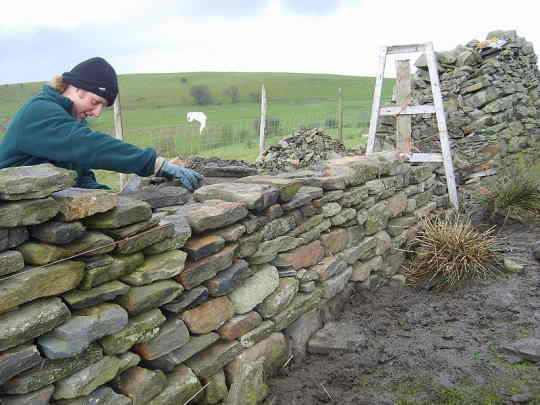 In dry walling they are stones laid in courses that go through the wall perpendicular to the wall face to bind both sides together. The smaller stones on the face of each wall. Stones loose on the ground, not from a quarry. A wall in Cumbria UK. There is a great love for these dry stone walls just about everywhere that they are used. They are often seen on open and wild moorland, on hillsides and fells that are popular with hikers. They can be enhancements to the landscape and they are very much of a part of the heritage value of many areas causing people to form associations in many areas to protect and conserve them. These walls are built without mortar and with just basic tools. The fact that there is no mortar allows them to settle and move, resisting the stresses of frost and bad weather. The have many times provided a double purpose of clearing the land of surface rocks and defining boundaries. They are expensive to build and to maintain, but the have extremely long life, often they are hundreds of years old. They provide shelter for livestock in bad weather and a habitat for smaller animals and birds, mosses, lichens and ferns. None of which can be said of fence wire. They can be built over steep rough ground and around crags and to cliff edges. A rough indication of how the walls are constucted is shown on the left. The throughs are not isolated stones like perpends in other masonry work, but they abut each other to form a full course the lenght of the wall. 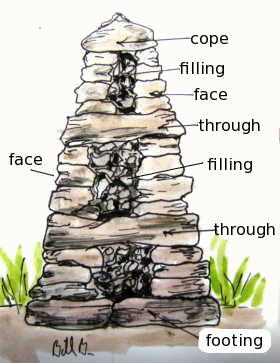 The cavity between the face stones is filled with small pieces of stone rubble which is known as fillings. Walls of this type are built with a taper, that is they are narrower at the top than the bottom, the faces slope inward and that inward slope is called the batter.In the photo above a waller is repairing a wall and as a guide he is stringing his lines of a purpose made frame that is called naturally enough a batter boards. The lines are not used in the same precise way that bricklayers use them, but a high and a low line is fixed and they are used to sight along to keep the stones in the same plane. 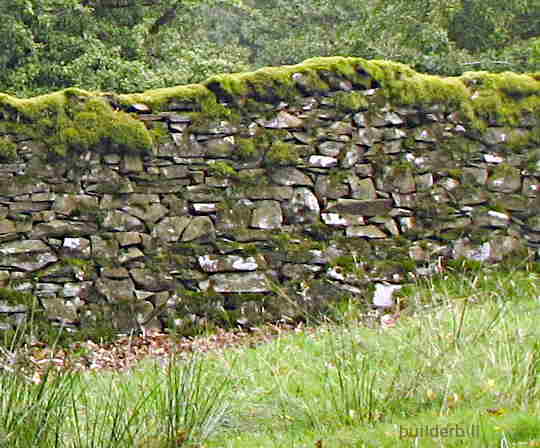 The jagged appearance of the top of this wall is typical of walls in sheep grazing country. They are done to stop sheep from trying to jump or climb over. (A lot cheaper than building the wall higher :-) The vertical pieces are known locally as cams.